Acting at the national and international level, the Central Council seeks to achieve the following goals: to continuously raise awareness of the Holocaust of Sinti and Roma; to see Antigypsyism acknowledged as a specific form of racism and condemned in all of Europe, given Europe’s responsibility to history. And in doing so, to safeguard the rights of minorities, to assure anti-discrimination protection, and to ensure the participation of the minority. In view of the crime against civilisation that is the Holocaust of the Sinti and Roma and the Jews, we must take the dangers of Antigypsyism as seriously as the dangers of anti-Semitism, and we must adopt appropriate measures in order to deal with them. Antigypsyist ways of thinking are deeply rooted in European cultural history. To this day, they continue to influence the actions of people and institutions – and it will take a long time to change this. Germany and many other European countries have been consequent in outlawing Anti-Semitism. Antigypsyism, however, receives little attention or sensitivity from policy makers and the media. The Framework Convention for the Protection of National Minorities (FCNM) of the Council of Europe, and the European Charter for Regional or Minority Languages are international milestones of the civil rights movement. As a consequence of the FCNM, Sinti and Roma were officially recognised as a national minority in Germany in 1997. Another important achievement is the resolution adopted by the European Parliament on 15 April 2015, recognizing the genocide of the Sinti and Roma and acknowledging Antigypsyism as a specific form of racism. The Central Council has joined forces with other civil society organisations (Amnesty International, ENAR, ERGO, FSG, OSF, ERRC) and formed a stronger advocacy coalition with the goal of deepening the substantial understanding and further strengthening the institutional recognition of Antigypsyism. The Central Council of German Sinti and Roma co-founded the international “Alliance against Antigypsyism” and published the “Reference Paper on Antigypsyism” with that goal in mind. Furthermore, the Central Council works closely together with the European Parliament Anti-Racism and Diversity Intergroup (ARDI), which was established for the first time in January 2016. ARDI also has formed an Antigypsyism Working Group under the leadership of Swedish MEP Soraya Post. Beyond that, the Central Council continuously strengthens international civil society alliances with (pro) Sinti/Roma organisations that advocate the same interests and political goals. The Central Council of German Sinti and Roma is the co-founder of the international “Alliance against Antigypsyism” and co-publisher of the “Reference Paper on Antigypsyism”. 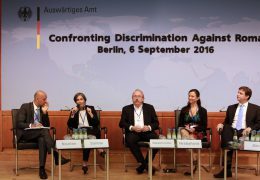 In September 2016, the German OSCE Chairmanship hosted a high-level event, co-organised with ODIHR, the Council of Europe and the Central Council of German Sinti and Roma. The focus of the conference “Confronting Antigypsyism: The Role of Political Leaders in Countering Discrimination, Racism, Hate Crimes and Violence Against Roma and Sinti Communities” was to address the question of how to tackle the increasing manifestations of racism and xenophobia against Sinti and Roma and how strengthen the cooperation between senior politicians to counter discrimination. At the European level, the Central Council promotes the establishment of a parliamentary coalition against Antigypsyism that will condemn Antigypsyism at all political levels and call on political decision-makers to assume responsibility. The Central Council closely observes and scrutinises the work done by the European Commission and the implementation of the EU framework for National Roma integration strategies. The Commission had regularly hosts consultation meetings with the Central Council and (pro) Sinti and Roma organisations. At the meetings, the Central Council had criticised the hitherto bad monitoring and evaluation of the way strategies have been implemented and had called for specific measures against Antigypsyism. In the future, Antigypsyism should be taken into account as a horizontal cross-cutting issue across all sectors (education, housing, employment, etc.). There has also been a positive development in the Directorate-General for Justice: the new High Level Group on combating anti-Semitism and racism has included Antigypsyism on its agenda. Furthermore, the Commission is to launch infringement proceedings against Hungary – as it did against the Czech Republic in 2014 and Slovakia in 2015 – on the grounds of segregation of Roma children in education. The Central Council has launched numerous other initiatives to combat the causes of flight and the stigmatisation of Sinti and Roma in the media in the context of the refugee debate. In collaboration with the Federal Ministry for Economic Cooperation and Development (short BMZ), the Central Council organised a meeting at the BMZ in Berlin in February 2016. Invited were numerous German organisations that support or implement projects and initiatives of and for the Roma in the countries of the Western Balkans. The aim was to facilitate exchange between different actors, to provide a platform for analysing the successes and challenges of current projects, and to discuss future opportunities for action. The Central Council also conducted a survey on this subject among Roma organisations active in the countries of the Western Balkans, German implementing organisations, and public institutions of the Federal Government (e.g. the GIZ, embassies, the Federal Foreign Office). The report is now available online, and the page “Western Balkans” provides an insight into the activities of the Central Council in this field. In view of the current situation in Europe, the Central Council criticises the dramatic developments – violent evictions and human rights violations against Roma – in many countries of Central and South-Eastern Europe. This policy of displacement at the local level forces the families concerned into hopelessness, into a situation without prospects. It is also one of the main reasons for the present Roma migration from Central and South-Eastern Europe to Western Europe. This situation is immensely dangerous, as shown by the almost daily attacks on refugee accommodations in Germany and the current refugee debate carried out in part completely irresponsibly by politicians and the media at the expense of the minority. The Central Council has initiated and supported various initiatives in order to stop forced evictions (Belgrade, Garmen), and has reached out to federal ministries, the European Commission and the United Nations. In October 2015, eight MEPs had hosted a hearing in the European Parliament with the aim of reviewing and discussing recent cases and studies from several countries. On this matter, the Central Council works closely together with Amnesty International, the European Roma Rights Centre, the Open Society European Policy Institute, the ENAR, and the ERGO Network. The right to housing is one of the fundamental human rights. It is long overdue that a body be established at the European level to improve the situation of Roma through its own on-sight interventions and independently of the respective bureaucracies of the individual states. This body would need to implement programmes especially in the housing construction sector, but not isolated from income-generating programmes. Such programs must be long-term programmes, and they must be developed directly by and with the Roma in local communities. In addition to facilitating participation in society, this also has the advantage of providing opportunities for members of the minority to earn income and acquire other valuable skills for the labour market. If that does not happen, the situation in the countries of origin will continue to worsen. With this in mind, it will be necessary to set up dedicated structures that will be able to use the available resources without directly involving the respective member states. For example, the Roma Education Fund in the education sector. Financed by a small percentage of unused resources of the European Commission, a similarly structured housing fund could programmatically intervene directly on the ground. In principle, most Roma organisations agree that the responsibility for improving the lives of large portions of the Roma population must rest with the governments concerned. However, it has become clear that neither the political will nor the real ability of each country is sufficient to implement the initiatives stipulated in various strategies. That is why the Central Council the German Sinti and Roma welcomed the initiative of the European Commission to set national strategies for Roma integration. This initiative is particularly important for the national Roma minorities in the new EU member states. However, when it comes to improving local housing and income-earning opportunities, financial resources are long overdue to replace paper-laden strategies. In September 2015, as part of the OSCE conference, the Central Council had hosted an event on the use of racism against Sinti and Roma in election campaigns. Relying on German documents, a report has been published covering the 2013 Bundestag election campaign of the German National Democratic Party (NPD). In addition to looking at the NPD election campaign, it will also present case studies of election campaigns in Hungary, Slovakia, Spain, Bulgaria, and the Czech Republic. The purpose of the publication is to raise the issue of Antigypsyism in political and public life at the European level, particularly taking into account the commitments of the Council of Europe, the European Union, and the OSCE. Romani Rose, Chairman of the Central Council of German Sinti and Roma, is a member in the Alliance for the European Roma Institute. The European Roma Institute for Arts and Culture (ERIAC) was launched in June 2017 and its purpose is to overcome the prejudice directed against the Sinti and Roma through projects in all of Europe. 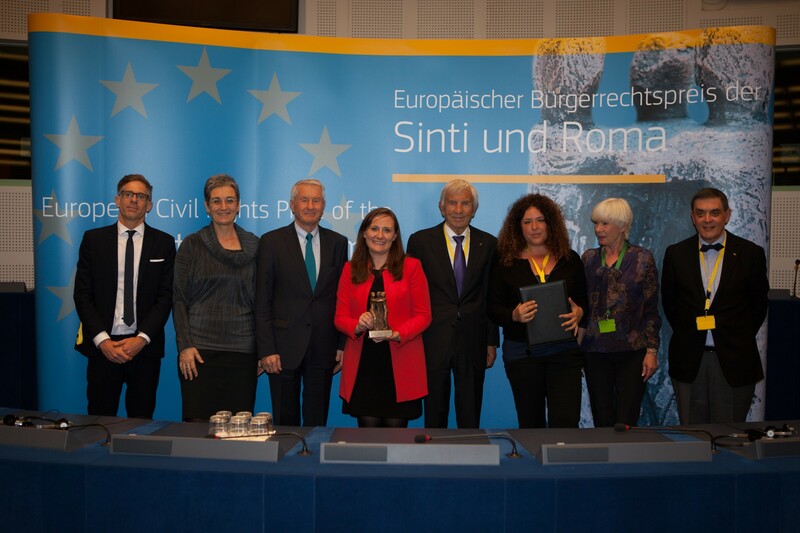 The Central Council together with the Documentation Centre and the Manfred Lautenschläger Stiftung awarded the European Civil Rights Prize of Sinti and Roma for the first time in the European Parliament in Strasbourg. MEP Ulrike Lunacek, Vice-President of the European Parliament, and Thorbjörn Jagland, Secretary General of the Council of Europe, attended the ceremony. The European Civil Rights Prize was awarded to Amnesty International, and Hungarian director Eszter Hajdú received the special prize for her documentary film “Judgment in Hungary” about the murders of six members of the Roma minority in 2008 and 2009. The Central Council calls on the European Commission to combat the deep-seated Antigypsyism – in particular the institutional discrimination against Sinti and Roma in the education and housing sectors – and social injustice in Europe, in order to ensure that all people can live in dignity in a society defined by democratic values and the rule of law. Numerous Directorates-General (DGs) of the European Commission cover EU policy on and for Roma, in particular the DG Justice and Consumers, DG Employment, DG EAC, DG NEAR, DG AGRI, and DG HOME. The coordination centre for the implementation of the EU Framework for National Roma Integration Strategies operates within DG Justice and Consumers, in the directorate D.1 “Non-discrimination and Roma coordination”. The Central Council continuously observes and scrutinises the implementation of the EU Framework for National Roma Integration Strategies, which was adopted by the European Commission and the EU member states in 2011. It also regularly attends consultation meetings with civil society organised by the EU Commission. Furthermore, the Central Council is committed to combating Antigypsyism as a cross-cutting issue and structural cause for the exclusion and discrimination of Sinti and Roma. The Central Council notes that there has been little progress after the adoption of EU framework strategy and the national integration strategies more than six years ago. At the same time, however, right-wing extremism, discrimination, Antigypsyism, racism, and nationalism have become commonplace and even acceptable in the political centre of society in all of Europe. to use European funds effectively to improve the situation of the Sinti and Roma, monitoring the implementation and the results. The European Parliament has long been raising a critical voice in European political debates, defending the human rights of the Sinti and Roma in Europe. Particularly the Committee on Civil Liberties, Justice, and Home Affairs (LIBE Committee) is concerned with the situation of the Sinti and Roma. The Central Council works closely with the European Parliament’s Anti-Racism and Diversity Intergroup (ARDI), which was established for the first time in January 2016, and which has formed an Antigypsyism Working Group under the leadership of Swedish MEP Soraya Post. The resolution adopted by the European Parliament on 15 April 2015 is an important achievement: It recognises the genocide of more than 500,000 Sinti and Roma perpetrated by the National Socialists and their allies, acknowledges Antigypsyism as a specific form of racism, and declares the 2 August to be the European Roma Holocaust Memorial Day. On 2 August 1944, the last 2,897 Sinti and Roma were murdered in the Auschwitz-Birkenau Nazi concentration camp. Furthermore, in October 2017, the European Parliament adopted the “Report on fundamental rights aspects in Roma integration in the EU: fighting Antigypsyism”. This report calls on the European Commission and the EU Member States to put combating Antigypsyism at the heart of their efforts to promote the socio-economic integration of Roma. Starting with 2016, numerous (pro) Roma organisations and members of the European Parliament have annually organised a “Roma Week”, which provides the opportunity to discuss the issue of Antigypsyism at various events. Following the adoption of the resolution by the European Parliament in April 2015, which recognised the genocide of Sinti and Roma and acknowledged Antigypsyism as a specific form of racism, the next issue on the list is how to proceed with its implementation and what role Parliament and policymakers should play in the process. The OSCE Office for Democratic Institutions and Human Rights (OHDIR) is one of the most important regional human rights bodies worldwide. ODIHR is based in Warsaw (Poland) and is active in Europe, the Caucasus, Central Asia, and North America. The Office promotes democracy, respect for the human rights, tolerance and non-discrimination, and the rule of law. ODIHR is the human rights institution of the Organisation for Security and Cooperation in Europe (OSCE), an intergovernmental organisation working for stability, peace, and democracy in its 57 participating states. In 2016, Germany assumed the Chair-in-Office of the OSCE. And in September 2016, the German OSCE Chairmanship hosted a high-level event, co-organised with ODIHR, the Council of Europe and the Central Council of German Sinti and Roma. The focus of the conference “Confronting Antigypsyism: The Role of Political Leaders in Countering Discrimination, Racism, Hate Crimes and Violence Against Roma and Sinti Communities” was to address the question of how to tackle the increasing manifestations of racism and xenophobia against Sinti and Roma and how strengthen the cooperation between senior politicians to counter discrimination. The conference brought together more than 130 participants, including members of the OSCE Parliamentary Assembly, the Parliamentary Assembly of the Council of Europe, the European Parliament, the German Federal Parliament, and other national parliaments, along with high-ranking government officials, civil society representatives, and other relevant stakeholders in the fight against Antigypsyism. to generally condemn Antigypsyism as much as anti-Semitism. Antigypsyism is not only an immediate threat to Roma in the OSCE region – it is a threat to our democracy and our community of values. to document Antigypsyism as part of its election monitoring and to respond to Antigypsyism with its institutions. to outlaw and combat Antigypsyism: to develop strategies for action and operational programmes to combat Antigypsyism, and to monitor Antigypsyism through existing OSCE/ODIHR structures. to call on the OSCE member states to enforce the relevant international agreements, e.g. the Framework Convention for the Protection of National Minorities of the Council of Europe that prohibits any discrimination based on belonging to a national minority. to officially recognise the genocide of the Sinti and Roma. to increase the participation of the Sinti and Roma civil society. Joint statement by Foreign Minister Frank-Walter Steinmeier and Michael Georg Link, Director of the OSCE Office for Democratic Institutions and Human Rights (ODIHR) on the responsibiltity of political leaders in countering discrimination and prejudice against Roma and Sinti. The Council of Europe is the oldest and largest international organisation for democracy and human rights in Europe; it includes 47 member states. The Framework Convention for the Protection of National Minorities (FCNM) of the Council of Europe, and the European Charter for Regional or Minority Languages are international milestones of the civil rights movement. As a consequence of the FCNM, the Sinti and Roma were officially recognised as a national minority in Germany in 1997. At the annual implementation meeting, the Central Council evaluates the implementation of minority rights in accordance with the Framework Convention and the Language Charter. In addition to the European Commissioner for Human Rights, Nils Muižnieks, the Council of Europe has a department dedicated to improving the situation of Sinti and Roma. Of great importance is also the European Court of Human Rights and its landmark judgments relating to the segregation and discrimination of Sinti and Roma. In collaboration with Roma youth organisations, the Youth Department of the Council of Europe implements the Roma Youth Action Plan, which strengthens youth structures and the empowerment of young Sinti and Roma, trains multipliers, and promotes human rights education by developing and disseminating educational resources on Antigypsyism. The Central Council of German Sinti and Roma keeps the Council of Europe informed about the human rights situation of Sinti and Roma. Thorbjørn Jagland, Secretary General of the Council of Europe, gave the laudatory speech for Amnesty International, winner of the European Civil Rights Prize of Sinti and Roma, at the award ceremony on 13 April 2016 in the European Parliament. Furthermore, the Central Council works closely with the Council of Europe on an initiative to combat Antigypsyism and on the establishment of the European Roma Institute for Arts and Culture. to document Antigypsyism in all its reports on human rights, minorities, and racism, and to respond to Antigypsyism with its institutions. to outlaw and combat Antigypsyism: to develop strategies for action and operational programmes to combat Antigypsyism, and to monitor Antigypsyism through existing structures of the Council of Europe, in particular through the Human Rights Commissioner and the European Commission against Racism and Intolerance (ECRI). for the Council of Europe to officially recognise the genocide of the Sinti and Romato collaborate on establishing the European Roma Institute of Arts and Culture. Zusammenarbeit im Aufbau des Europäischen Roma Instituts für Kunst und Kultur. For many years, the Central Council of German Sinti and Roma has observed the work of the IHRA and has been a guest on the Committee on the Genocide of the Roma. The Central Council / the Documentation and Cultural Centre of German Sinti and Roma has been a member of the German IHRA delegation since 2016. The Central Council welcomes the decision of the IHRA to focus more on the genocide of Sinti and Roma. The Central Council is committed to ensuring more political attention and support for the research, commemoration, and remembrance of Holocaust of Sinti and Roma. There are still many gaps when it comes to historical reappraisal – in particular, there is a lack of scientific reports on the genocide of the Sinti and Roma in Transnistria and former Yugoslavia. In 2010, Martin Holler (pdf) published a notable report on the Nazi genocide of Roma in occupied territories of the Soviet Union on behalf of the Documentation and Cultural Centre of German Sinti and Roma. In May 2016, the IHRA Member Countries passed a resolution to adopt a working definition on anti-Semitism. The Central Council of German Sinti and Roma calls on the IHRA to condemn and combat the Antigypsyism deeply rooted in European history as much as anti-Semitism. for more political support to be given to the governments of Hungary and the Czech Republic to preserve the endangered and undignified Holocaust memorial sites in Komarom and Lety u Pisku. Removal of the pig farm on the site of the former Nazi labour camp of Lety u Pisku in the Czech Republic: Despite mass protests organised by Roma and non-Roma organisations calling for a dignified memorial site, the Czech government has as of yet not removed a pig farm that currently stands on the site of the former Nazi labour camp of Lety u Pisku. Promotion of historical reappraisal and scientific research of the genocide of the Sinti and Roma, particularly in Transnistria and former Yugoslavia.